This is a combined project I did for my Color Design Theory Class as well as for a Flash Class. Programs used were Adobe PhotoShop and MacroMedia Flash MX 2004. In Digital Color we learned about color theory. We were able to go into Adobe PhotoShop and recolor a photograph by using a palette. A friend of mine named Joe Carrasco from Chicago, IL USA told me that he wanted to develop a website for his T-shirt Business. He wanted a site that was specifically geared towards kids ages 10 - 15 years old. He wanted the site to be user friendly. He also wanted something that would appeal to this age group of kids as well their parents. The site never made it off the ground to go public, but is an example of some my website design work. At the moment I am working on getting more space to accommodate this file. Above: The first two pictures above are some examples of what the homepage looks like. When the page opens music is suppose to play. All the user has to do to shut it off is to click on the radio you see in the photo. Radio is located towards the ground. 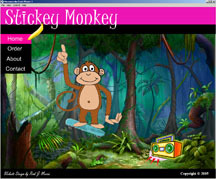 The monkey is the mascot for this website and he comes skateboarding off into a circle and then jumps down and starts dancing. Left: To the left, 3rd picture down is the order menu. 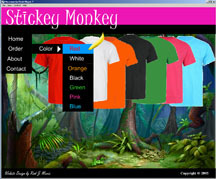 The idea here is that a rack of t-shirts spin out and the user gets to choose the color and design that he or she wants to order. Bottom: Towards the bottom we see Joe's photograph. On this page it tells a little about the owner of the website or company. This was mainly for Joe's benifit. It not only tells a little about Joe, but shows that he stands behind his T-shirts and for any reason at all he will buy these Tees back from unhappy customers. It was sort of a trust issue. 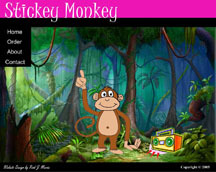 Concerns: Music was thought to be a distraction and also Joe did not have the copyrights to the song being played. 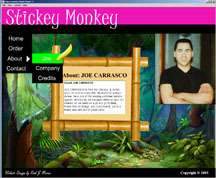 The Monkey wasn't what Joe had in mind and wanted to use another monkey.